Cat lovers can rejoice in the quirkiness of their feline friends with these insightful and curious poems from the singular mind of house cats. In this fully illustrated book of tongue-in-cheek poetry, the author of the internationally syndicated comic strip Sally Forth helps cats unlock their creative potential and explain their odd behavior to ignorant humans, With titles like 'Who Is That on Your Lap?, This is My Chair, Kneel Before Me, Nudge, and Some of My Best Friends Are Dogs, the poems collected in I Could Pee on This perfectly capture the inner workings of the cat psyche. With photos of the cat authors throughout, I Could Pee on This shows cats at their wackiest and most lovable. `Poems by cats? Honestly? 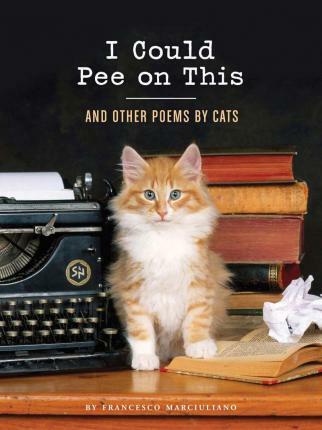 Yes.`I Could Pee on This: And Other Poems by Cats' once opened, is as evil as an evil little book can get. It went from desk to desk to desk here at The Post, clawing anyone who's had or known a feline into its silly spell and sucking precious tens of minutes into its hairy vortex. Francesco Marciuliano is the author of Sally Fourth, an internationally syndicated family comic strip that appears in nearly 800 newspapers around the world. In addition to his cartoon work, Francesco's writing has also appeared in The Onion News Network, TimeOut New York, McSweeney's and numerous other publications online and in print. Over the years he ahs developed a sizable and steadfast audience though his web endeavors, including his very popular blog, his long-running webcomic Medium Large and his years of chronicling his rather unusually childhood online.